The MP5 is a compact sub machine gun in use by the Regiment since the late 70s. The MP5A3 (L91A1) variant, with a collapsible stock is ideal for close quarters combat and was the weapon carried by the majority of the troopers involved in Operation Nimrod. The 9x19mm Parabellum round fired by the MP5 was preferred in hostage rescue scenarios as it was deemed less likely to pass through the target (or walls) and strike a hostage. The prevalance of body armour, however, means that modern-day counter terrorist (CT) teams may elect to instead employ a short-barrelled carbine chambered in 5.56 x 45mm NATO such as the C8 CQB (L119A1 with 10 inch barrel). It's thought that SAS/SBS CT teams now mostly use C8 carbines. The SAS also uses a cut-down version of the MP5, with a shortened barrel and without stock, called the MP5k (L80A1) . The MP5k is small enough to be concealed beneath a jacket, especially when fitted with a 15-round magazine, making it ideal for undercover work and close protection duties. The MP5KA1 (L90A1) variant features low-profile sights to further aid covert carry. A further variant of the weapon, the MP5SD, with an integrated suppressor, is used for dealing with sentries or any other threat that needs to be neutralised quietly. When used with sub-sonic ammunition, the MP5SD is extremely quiet. 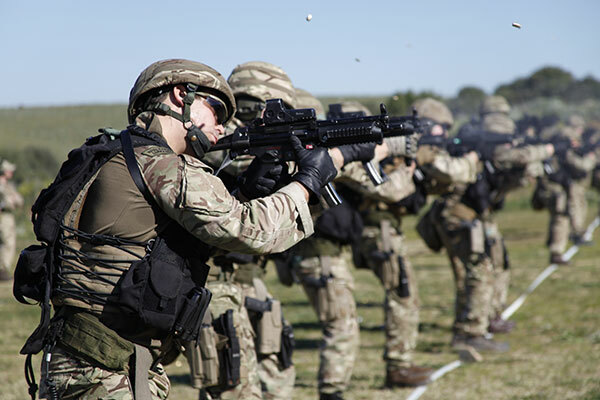 Royal Marines with 43 Commando Fleet Protection Group fire MP5A3 (L91A1) submachine guns. These are fitted with holographic sights and tri-rail RIS handguards for the mounting of illumination devices, laser aiming devices and foregrips.